How great to get a photo of such an interesting encounter! Hi Mick--just quick on the draw, and a huge slice of luck! Thanks. HA! I got footage just today of Pied Oystercatchers chasing *each other* away...any explanation as to this behaviour? 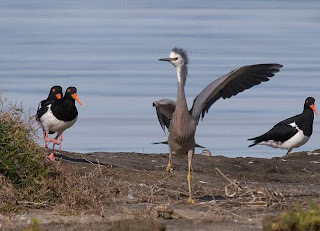 Pied Oystercatchers at this time of year are often involved in skirmishes. The 2 chasing the heron have a nest nearby, so that's their excuse. In flocks, birds have either paired or are in the process of doing so, so interlopers are often involved in brief, but sometimes prolonged, chases. Feathers do fly!